Dartmoor, a desolate tract of land in Devonshire, England, extending from N. to S. about 22 m., and from E. to W. 14 m., at an elevation of 1,700 ft. above the sea; area estimated at about 150,000 acres. The surface is alternately swamp and barrens, producing a coarse grass on which cattle and sheep subsist during the summer months. Numerous hills of granite, called tors, break the surface, and rise to a considerable elevation, Yes tor being 2,050 ft., and Cawsand Beacon hill 1,792 ft. above the sea level. Of these tors, 150 are enumerated in Carrington's poem on Dartmoor. In the centre of the moor is an extensive swamp, in which the rivers Dart, Teign, Taw, Erme, Yealm, and 50 smaller streams take their rise. The climate is at all times cold and moist. Storms from the Atlantic sweep over the moor, and it is difficult to imagine a more desolate spot during winter. A few scattered hamlets, occupied by quarrymen, contain the only population. There are productive tin mines at Wheal, Duchy, and Birch tor, and copper and manganese are found. Druidical remains may be traced in many places, especially below Sittaford tor, at Grimspound, and at Drewsteignton. The greater part of the tract was afforested under the name of Dartmoor forest by King John. Under Edward III. it was united to the duchy of Cornwall. - Dartmoor is chiefly noted as the site of a prison built in 1809, at a cost of £127,000, for the custody of French prisoners of war. At one time it contained 10,000 inmates. On the breaking out of hostilities with the United States in 1812, 2,500 impressed sailors, claiming to be American citizens, and refusing to serve in the British navy against their country, were imprisoned in Dartmoor, where most of them were kept till the end of the war. Accounts of the harshness of their treatment reached the United States, and created much feeling. This was especially the case on an occasion when the guard fired upon the prisoners. Explanations, however, have shown that the occurrence was the result of a mistake. 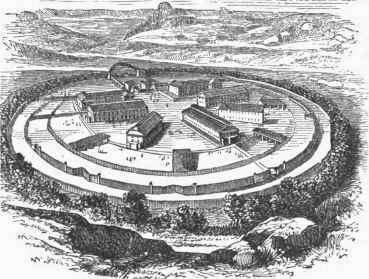 The Dartmoor prison enclosures occupy an area of 30 acres, encircled by a double line of lofty walls. In 1850 the prison was fitted for the reception of convicts. About one half the annual expense of maintaining the institution is repaid by the industrial employments of the inmates.